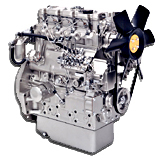 This 0.5 - 2.2 litre, 7-45 kW, 8 model engine range has been developed alongside our customers to fulfil their needs in the construction, materials handling, agricultural/turf, genset and compressor markets, becoming the latest class-leading diesel range from Perkins. The 400 series brings with it a wide range of benefits, which provide significant improvements over its predecessor, the 100 series. Noise, overall dimensions and cost of ownership have all been reduced, whereas power, torque, reliability and dependability have all been increased. Infact the flexibility and specific benefits of the 400 series make it the ideal choice for as many as 30 different applications across a range of market sectors.